The aim of this study was to characterize β-glycosidase (BGL) andphospho-β-glycosidase (PBGL), which is responsible for the oenological aromatic characteristics of wines. Six Oenococcus oeni strains were evaluated for their enzymatic activities by using p-nitrophenyl-β-D-glucopyranoside (pNPG) method. The sequences of BGL and PBGL genes were analyzed by bioinformatics techniques and validated by quantitative real-time reverse transcription polymerase chain reaction technology (qRT-PCR). The genetic codes of wine-related β-glycosidases in the O. oeni were also analyzed to compare with the other strains. It was found that O. oeni CS-1b displayed the highest activity among all the strains. The enzymatic activity was high in the disrupted cell solution but low in the supernatants obtained from the intact cultured strain. It indicated that glycosidases were possibly mainly in cell-bound or intracellular form in those strains. The results of GC-MS showed that strains CS-1b and SD-1f which have higher level of gene expression can produce more kinds of aromas and some of them related to β-glucosidase were significantly increased. The wine aroma as the color and taste is one of the most important sensory factors responsible for the quality of wine [1,2]. In winemaking, the secondary fermentation, malolactic fermentation (MLF) occurs after alcoholic fermentation is mainly carried out by lactic acid bacteria (LAB), especially O. oeni [3-6]. O. oeni is a desirable organism in dominating the MLF process because of its high stress-tolerance and significantly positive effects on the complexity of wine aroma [7-9]. It has been therefore widely applied as a commercial starter culture in wine production [10,11]. The precursors of aroma substances in some wines are mostly glycosylated in grape skin before they are released by corresponding glycosidases or acids [2,12,13]. In other words, those aroma compounds could be released by either acidic or enzymatic hydrolysis to contribute a more complex sensory profile to wine [14,15]. However, at an industrial scale, the two hydrolysis approaches mentioned above would be optimized to obtain favorable traits by increasing the reaction by β-glycosidase from fungal origins  without collateral or side effects causing the loss of anthocyanins in wine . It is a concern that aglycone structure would appear to be rearranged to form undesirable flavors if acid hydrolysis is not well-controlled [14,18]. The glycosidases, especially β-D-glycopyranosidase, are responsible for the cleavage of the glycoside bond of disaccharide glycosides which are odourless glycoside aroma precursors, with great specificity and efficiency. For this reason, they are usually recognized as an appropriate tool to the release of wine aroma [19-21]. However, the endogenous grape β-glycosidase or commercial fungal β-glycosidase would be largely inhibited by the physicochemical environment of fermentation, such as low sugar content, high acidity and ethanol concentration, etc. The β-glycosidase derived from wine-related lactic acid bacteria (LAB), especially O. oeni, is important and can contribute to the hydrolysis of aroma precursors during MLF [22-25]. Although numerous published studies have confirmed that the potential of BGLs from O. oeni strains can enhance the flavor, mouth-feel and even the final quality of wine [13,14], our study attempted to reveal the finding the mechanisms at DNA level by expressing BGL and PBGL genes in O. oeni strains. The relationships between the species of strains and the location of β-glycosidase in the cell were investigated to reveal the possible involvement of the glycosidase activity and their expression level by qRT-PCR technology. The results of this study could be helpful in fully understanding the function of glycosidase during MLF and exploring the potential of O. oeni in winemaking. Five of six O. oeni strains (c-1b, NM-2c) used in this study were obtained from our laboratory collection(College of Enology, Northwest A & F University, Yangling, Shaanxi, China) and originated from different vineyards or grape varieties planted in China. O. oeni 31DH (O. oeni CICC 6066), a commercial strain, was offered by the China Center of Industrial Culture Collection (CICC) as described by Su et al. All these strains were revitalized in an acidic tomato broth (ATB) consisting of 10 g/L glucose, 10 g/L peptone, 5 g/L yeast extract, 0.5 g/L cysteine/HC1, 0.2 g/L MgSO4•7H2O, 0.05 g/L MnSO4•4H2O supplemented with 250 mL/L tomato juice, with a final medium pH of 4.8. The incubation temperature was adjusted to 25ºC. Cellular growth of all strains was monitored through measuring optical density values at 600 nm (OD600). Cells were harvested by centrifugation at 5000 g for 10 min at 4ºC at the exponential growth phase which displayed OD600 values about 1.00. The strains possessing high β-glycosidase activity was screened out on agar plates. These agar plates maintained a similar composition to that of ATB broth except for the supplement of 1 g/L agar powder and 5 g/L arbutin that an analog substrate of β-glucoside. After sterilized at 121ºC for 20 min, the resulting ATB agar medium was used to prepare specific plates which contained 0.02% (W/V) ferric ammonium citrate, a substance functions as a visualization reagent when arbutin is consumed or decomposed. The harvested cells as described previously were inoculated in 10 mL fresh ATB broth and subsequently cultivated at 25°C until the OD600 value reached approximately 1.00. Then 10 μL of the liquid culture was spotted on the surface indicative agar plates. Finally each plate was inoculated with all of the six isolates at 25°C for 8-10 days in the dark for screening. The isolates showing a darker brown circle around the colony on indicator agar plates indicated a higher β-glucosidase activity. To identify the profiles of phospho-β-glucosidase (bglB) and β-glucosidase (bgl) genes in O. oeni isolates as well as to verify PCR-amplified fragments, four strains (SD-1d, SD-2gf, 31-DH, NM-2c) were selected for PCR detection and sequencing on the base of the screening results. Genomic DNA was extracted from O. oeni isolates using an Ezup Column Bacteria Genomic DNA Purification Kit (Sangon Biotech, China). The extraction was carried out according to the operation instructions suggested by the manufacturer. The primers which designed  for PCR amplification of bglB and bgl genes were listed in Table 1. The PCR amplification system was as follows: 10 × buffer (2.5 μL), 2.5 μM each primer (1 μL), 2.5 mM dNTP mixture (2 μL), 5 U/μL ExTaq DNA polymerase (0.2 μL), and Genomic DNA (2 μL), and supplied with distilled water to an final volume of 25 μL. These mixtures were cycled in a PCR amplification device (Bio-Rad, USA), programmed sequentially as follows: 94°C for 4 min, followed by 35 cycles of 94°C for 1 min, 59°C for 50s (bgl gene) and 57°C for 50s (bglB gene), 72°C for 1.5 min, and a final extension performed at 72ºC for 10 min. The PCR-amplified fragments were separated by 1% (w/v) agarose gel electrophoresis and photographed by a gel imaging system (ChampGe I 5000, China). Targeted fragments were recovered using a SanPrep Column DNA Gel Extraction Kit (Sangon, China). Table 1: The primers used in PCR assays. The recycled products were recombined with pUCm-T vector (Sangon, China). Then the recombinants were transformed into E. coli TOP10 cells (TianGen, China) in order to yield multiple copies of targeted DNA. What was processed next was the blue/white spot screening, conducted on Luria-Bertani (LB) agar plates (containing 100 μg/mL ampicillin, 48 μg/mL isopropyl-β-D-thiogalactopyranoside, 40 μg/mL X-gal) at an incubation temperature of 37ºC for 24 h. Then the plates were placed at 4ºC for growth of the positive clones and thus its color development. Plasmids of white spot colony were extracted using the SanPrep Column plasmid Mini-Preps Kit (Sangon, China) as instructed as the manufacturer, 1% (w/v) agarose gel electrophoresis was then adopted for the validation of positive colony after specific digestion with the restriction enzyme PstI (Sangon, China). Finally the positive recombinant plasmid was sent for DNA sequencing, submitted to and executed by Sangon Biotech (China). The obtained bgl and bglB gene sequences were submitted to the GenBank database to obtain their accession numbers, as well as align for the homology with those available in the database. Then, it was further analyzed by bioinformatics software (Table 2). O. oeni PSU-1 was used as a reference strain during the aligning analysis. Table 2: Bioinformatics techniques for analyzing genes and their encoding products. The expression of bgl and bglB gene at transcriptional level was carried out by a real-time quantitative RT-PCR. Primers used here are listed in Table 3. Table 3: The primers used for qRT-PCR. The resulting amplification products from the genomic DNA using synthetic primers were checked by 1% (w/v) agarose gel electrophoresis to verify the specificity of these primers. For extracting total RNA, cells grown in ATB broth were harvested as sampling for the enzyme activity measurement. The extraction was processed according to the instructions of an RNAprep pure Cell/Bacteria Kit (TianGen, China). Reverse transcription was also conducted as detailed by the manufacturer of a Fast Quantative RT kit (with gDNase) (TianGen, China). The ldhD gene in O. oeni was chosen as an internal control according to the previous studies [6,27-30]. The preliminary treatment and preparation before qRT-PCR process was performed on a SuperReal PreMix Plus (SYBR Green) kit (TianGen, China) as follows: the reverse transcription products were diluted using ddH2O (RNase-free) to a final concentration of 100 ng/μL; the reaction system contained 12.5 μL 2 × SuperReal PreMix Plus buffer, 0.6 μL each primer (10 μM), 1 μL cDNA (100 ng/μL), 5.3 μL ddH2O (RNase-free). The final qRT-PCR reaction was programed as Table 4 and carried out on Bio-Rad IQ5 real-time PCR system (Bio-Rad, USA). O. oeni 31-DH was treated as a reference strain. Template-free reaction mixtures were served as the controls. Each assay was done in triplicate. Table 4: The β-glycosidase activities of O. oeni strains, *Different letters show significant differences (but with each P ≤ 0.01) between different strains. The nucleotide sequences of bgl gene in O. oeni SD-1d, SD-2gf, 31-DH, NM-2chad been deposited in the Gen Bank database under the accession number KM435262, KM435263, KM435264, KM435265, respectively. That for bglB gene of the same strains was accessioned with the number KM435258, KM435259, KM435260, KM435261, respectively. The information about the two genes in genomic DNA of O. oeni PSU-1 was shown as the number CP000411. Glycosidase activity was measured according to the protocol described by Barbagallo et al. with minor modifications. Cells of the six strains were grown in ATB broth to investigate their practical application potentiality in the wine industry. The growth of isolates was monitored through measuring the OD600 values until the middle of the exponential phase (OD600≈1.5) was reached (42 h for O. oeni SD-1d, 52 h for O. oeni SD-2gf, 58 h for O. oeni 31-DH and 65 h for O. oeni NM-2c). The whole cells were immediately harvested from 1 mL of bacterium culture by centrifugation (5000 × g for 10 min at 4ºC) and washed twice with 0.85% NaCl, then suspended in 0.5 mL 0.85% NaCl solution, followed by mixing with an equal volume of 2 x citrate-phosphate/pNPG solution (pH 5.0, containing 5 mM pNPG). This reaction was maintained for 1 h at 37ºC and ended by adding 2 mL of 1M Na2CO3. After each sample was centrifuged for 15 min (5000 x g, 4ºC), Two hundred μL of the supernatants was transferred into a well on a 96-well plate and each absorbance measured using a Multiskan Spectrometer (Spectra Max 190, USA) at 400 nm. 0.85% NaCl solution without any cells served as control. This activity was defined as micromoles of pNP produced per minute from pNPG by per unit mass of cells, μmol•(g•min)-1. Two most active strains CS-1b and SD-1f were chosen from the six O. oeni strains, while commercial strain 31-DH was used as a control. A Cabernet Sauvignon was used to carry out the alcoholic fermentation according to Wine Technology after filled and sealed the tank and preserved at 4ºC. After the alcoholic fermentation, 40 mL of each bottle was used to grow on ATB medium and reach to logarithmic phase(OD600≈1.5). Then the culture was centrifuged (5000 g, 4ºC, 15 min) and washed by sterile 0.85% NaCl. The bacterium Then, The supernatant in the wine (add 60 mg/L SO2 without inoculation was used as a control. The experiment was duplicated. The sealed bottles were placed at 22ºC and detected for malic acid every 24 h until it was not detectable. Ten mL of MLF wine sample was filtered by 0.45 μm membrane. The filtrate was added the into 20 mL bottle and mixed with 2 g of NaCl, 50 μL (0.234 g/L) of 2-octanol internal standard. SBSE stirring bar was used to do the extraction for gas chromatography. NIST02 map library was used to search for the identification and quantification. The calculation for the components under test content was by the formula: concentration of each components (mg/L)=peak area of each components *concentration of internal standard(mg/L)*f/peak area of internal standard represent the internal calibration factor of each components. The development of a dark brown circle around the colonies of each isolates was able to synthesize β-glycosidase and have enzyme activity. As presented in Figure 1, all assayed strains clearly showed brown circles around the colonies at different levels. Based on PCR detection, the presence of genes coding β-glycosidase (bgl) and phospho-β-glycosidase (bglB) was identified from four of the six strains O. oeni for proceeding the next experiment. Figure 1: 1-6 represents O. oeni SD-1d, SD-1f, SD-2gf, CS-1b, 31-DH and NM-2c, respectively. Single PCR products of 2215 bp (bgl) and 1443 bp (bglB), which were observed in all O. oeni strains, were successfully amplified by the PCR assay. Two target genes were validated by agarose gel electrophoresis (Figure 2). As to the nucleotide sequences, the aligned results given by MEGA 6.06 revealed 99.9% identity between the five strains in regard of bgl (not shown). As for bglB, O. oeni NM-2c shared 99.6% identity with O. oeni PSU-1, while the other three strains possessed 97.8% identity when aligned with the reference strain. Nevertheless, the protein BGL, as well as PBGL, showed that the sequence similarity climbed up to 99% when compared with the reference strain. Therefore, the commercial strain O. oeni 31-DH was made as an example for further bioinformatics prediction to study BGL and PBGL. Figure 2: M: DNA Marker DL 5000; 1-4: PCR products based on genomic DNA of O. oeni SD-1d, SD-2gf, 31-DH and NM-2c, respectively. Both of the enzymes featured weak hydrophobicity according to ProtScale online analysis through the scores ranging from -2.94 to 1.90 and from -3.37 to 2.00 for PBGL and BGL from O. oeni 31-DH, respectively (not shown). SignalP 4.1 Server and TMpred suggested the absence of a signal peptide cleavage site and membrane-spanning region in both the proteins (not shown). The Protein BLAST that PBGL expressed by O. oeni 31-DH probably contained conservative domains bglB (shown as a bidirectional sparrow in Figure 3a) responsible for carbohydrate transportation and metabolism, and likely contained other domains likecelA, BGL, PLN02814 and glycosyl hydrolase family 1 as for BGL (Figure 3b), this blast result showed a possible domain–fibronectin type III-like domain with the prediction described as unkown–made up of several amino acids (aa), and likely N-terminal domain of glycosyl hydrolase family 3 as well as C-terminal domain of glycosyl hydrolase family 3 (involved in catalysis and likely in binding beta-glucan), which was located from No.577 to 647 aa, No.33 to 280 aaand No. 313 to 546 aa in the protein, respectively. In addition, it was predicted by ScanProsite that a specific N-terminal recognizing region (10-24 aa, FLWGGAVAANQLEGG) and a catalytic active site (373-381aa, LFIVENGLG) of glycosyl hydrolase family 3 existed in the PBGL. As to the BGL, only one catalytic active site (214-231aa, ILREEWGFKGLVMSDWGT) was observed. Both proteins were likely distributed in cell cytoplasm according to subcellular localization prediction on line. 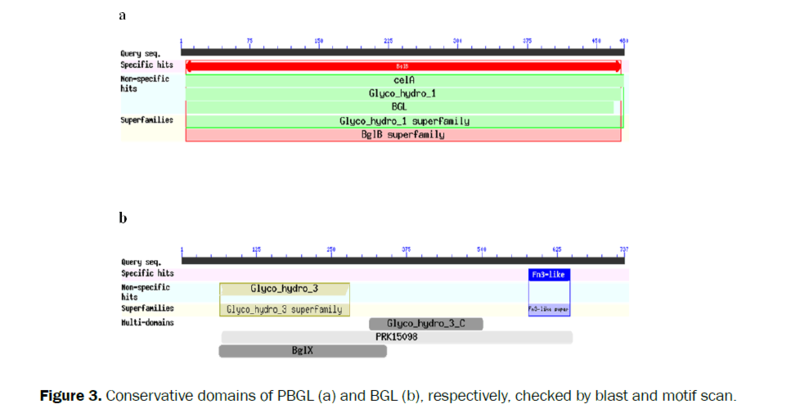 Figure 3: Conservative domains of PBGL (a) and BGL (b), respectively, checked by blast and motif scan. Figure 4: Relative expression level of the same glucosidase gene from different O. oeni strains, *Capitals means significant differences at 1% level. Figure 5: Primer amplification specificity in qRT-PCR. M: D2000 DNA Ladder; 1-3: ldhD, OEOE-0224, OEOE-1569 gene in O. oeni SD-1f, respectively. ß-glucosidase activities of all the tested strains which were grown in ATB medium were determined (Table 4). Among them, O. oeni CS-1b and SD-1f exhibited higher enzyme activity than the others and up to 7.20 μmol•(g•min)-1 and 6.43 μmol•(g•min)-1, respectively. In addition, there were significant differences between different strains. Table 5: The physicochemical properties of the sample wine after AF. The physicochemical properties of experimental wines after alcoholic fermentation are shown as Table 5. From the results of GC-MS we found that O. oeni SD-1f and CS-1b have higher enzyme activity also exhibited higher genes expression among the strains can produce higher level of aromas than 31-DH and control. Some high yield aromas can be seen on Table 6 which is a result of high level of gene and gene expression. Table 6: High yield aromas produced by CS-1b and SD-1f. Comparing the structure characteristics of various compounds with NIST Spectral library of standard compounds in map, we found that the control without MLF had 31 aroma it’s total content was 12.391 mg/L: the sample with MLF by CS-1b had 45 aroma it’s total content was 14.088 mg/L: the sample with MLF by 31-DH had 33 aroma its total content was 17.847 mg/L: the sample with MLF by SD-1f had 32 aroma it’s total content was 16.289 mg/L (date not shown). Aromas, such as apple, banana, pineapple, grape, brandy and rose have large contribution to wine aroma quality of aroma substances. From the result we found that the content of 3-Methoxybutyl acetate reached 5.705 mg/L which probably be related to the high level of gene expression. In general, the wine produced by CS-1b had the most species of esters and higher content of ethyl caprylate which has the aroma of brandy and ethyl caproate like apple and grape . Phenethyl alcohol had the scent of sweet roses which content in CS-1b treatment group can reach to 5.978 mg/L. Nerol that had the smell of roses and neroli also with fresh lemon and citrus was more gentle than geraniol. Volatile aroma compounds are very important to the wine sensory quality . However, some aroma substances are in free form rather than bond state which usually may not become volatile to be directly perceived by consumers. However, they can be released to be aroma compounds after the some metabolism ways, such as enzymatic hydrolysis by microorganisms during MLF . Therefore, it is a good practice for the industry to isolate and characterize wine-related organisms in order to improve the final quality of wine. In this study, the six O. oeni strains were assayed for the description of BGL and PBGL respectively encoded by bgl and bglB gene to predict their possible structural and functional profiles. The enzymatic assays under ATB condition revealed that higher β-glycosidase activity was related to certain specific strains. The previous studies also indicated that β-glycosidase activity profiles are highly strain-dependent [9,20,34]. Based on the results of this study, the β-glycosidase activity was evidently diverse exhibited in different cell of each strain to indicate that the activity in O. oeni had either highly strain specificity or different origins, eg. PBGL and BGL. Although some studies reported that extracellular activities of O. oeni were observed [6,22], the genes encoding extracellular β-glucosidase were not been found yet. In agreement with the previous prediction (see section 3.2), our results interestingly revealed that the expression level of bgl in an individual strain was highly associated with the glucosidase activity in cell disruption supernatant. The enzyme activity detected in the supernatant was dependent upon the expression level of bgl in O. oeni. In addition, it was apparent that the order of the bglB gene expression levels was consistent with the order of enzyme activity level of corresponding intact cells and pellet. The enzyme activities detected in intact cells and pellet were likely associated with the expression level of the bglB gene in O. oeni. Previously, many studies proposed that glycosidic activities of the intact LAB cells can be revealed by the presence of the phosphoenolpyruvate-dependent phosphor transferase system (PEP-PTS) . Substrates (such as β-glucoside) were transferred into the cells across the plasma membrane by PTS and then phosphorylated at the expense of PEP, which was consumed by intracellular phospho-β-glucosidases finally [35-37]. Therefore, it could be explained that glycosidic activities of intact O. oeni cells were mostly contributed by phospho-β-glucosidase activities, as the activities observed in the pellet. In addition, non-phosphorylated pNP-β-D-glucopyranoside cannot be hydrolyzed by phospho-β-glucosidase , this was consistant with the previous study on its three- dimensional structure from its close homologues, such as 6-phospho-β-glucosidase from Lactococcus lactis and that from Lactobacillus plantarum, which contained a phosphate-binding site for phosphate molecule [38,39]. Fortunately, PBGL from 31-DH in our research showed the identity of 31% compared with 6-phospho-β-glucosidase from Lactococcus lactis (PDB code 1PBG), even that of 63% compared with 6-phospho-β-glucosidase (PDB code 3QOM) from Lactobacillus plantarum (data not shown). Based on their structural and function conservation, it could be speculated that the strains CS-1b, SD-1f as well as 31-DH might have excellent potential of hydrolyzing different oligosaccharides as the same as BGL from Lactobacillus plantarum CECT 748T . From the results of GC-MS, it was found that the main volatile aroma of wine including esters, acids, alcohols, terpene, ketone and phenols. The aroma of wine can be enhanced by MLF in the order: CS-1b (45 kind)>SD-1f (34 kind)>31-DH (32 kind). The relative high level of bglB and bgl genes led to relative high expression of β-glucosidases; strains CS-1b and SD-1f starter had significant contribution to wine aroma and the enhance of aromas were similar to other research [41-43]. The findings of this study could lead to better practical application of O. oeni strains in the wine industry. This work was financially supported by the major science and technology program of Ningxia hui autonomous region (2016BZ0603), and also sponsored by the National Key R&D Program of China (2016YFD0400504), as well as China technology Agriculture research system (CARS-30-jp-3). We also gratefully acknowledged the technical aid offered by Ya-Hui Li for primers design in qRT-PCR. Mtshali PS. Screening and characterization of wine-related enzymes produced by wine-associated lactic acid bacteria. Stellenbosch University 2007. Bartowsky EJ and Borneman AR. Genomic variations of Oenococcus oeni strains and the potential to impact on malolactic fermentation and aroma compounds in wine. Appl Microbiol Biotechnol. 2011;92:441-7. Ribéreau-Gayon P, et al. Handbook of enology: the microbiology of wine and vinifications. Chichester: Wiley and Sons 2006. Ruiz P, et al. Bacterial biodiversity and dynamics during malolactic fermentation of Tempranillo wines as determined by a culture-independent method (PCR-DGGE). Appl Microbiol Biotechnol. 2010;86:1555-62.
du Toit M, et al. Lactobacillus: the Next Generation of Malolactic Fermentation Starter Cultures-an Overview. Food Bioproces Technol. 2011;4:876-906. Olguin N, et al. beta-Glucosidase Activity and bgl Gene Expression of Oenococcus oeni Strains in Model Media and Cabernet Sauvignon Wine. Am J Enology and Viticulture. 2011;62:99-105. Spano G and Massa S. Environmental stress response in wine lactic acid bacteria: Beyond Bacillus subtilis. Critical Reviews in Microbiol. 2006;3277-3286. Pogorzelski E and Wilkowska A. Flavour enhancement through the enzymatic hydrolysis of glycosidic aroma precursors in juices and wine beverages: a review. Flavour and Fragrance J. 2007;22:251-254. Michlmayr H, et al. beta-glycosidase activities of Oenococcus oeni: Current state of research and future challenges. Mitteilungen Klosterneuburg. 2012;62:87-96. Lerm E, et al. Malolactic Fermentation: The ABC's of MLF. South African Journal of Enology and Viticulture. 2010;31:186-212. Solieri L, et al. Characterization and technological properties of Oenococcus oeni strains from wine spontaneous malolactic fermentations: a framework for selection of new starter cultures. J Appl Microbiol. 2010;108:285-98. Bartowsky EJ, et al. Chasing wine aromaDoes Oenococcus oeni have the potential to release aroma compounds from authentic grape precursors. Wine Industry Journal. 2004;19: 24-31. Michlmayr H, et al. A beta-glucosidase from Oenococcus oeni ATCC BAA-1163 with potential for aroma release in wine: cloning and expression in E. coli. World J Microbiolo & Biotechnol. 2010;26:1281-1289. Hernandez-Orte P, et al. Aroma development from non-floral grape precursors by wine lactic acid bacteria. Food Research International. 2009;42:773-781. Michlmayr H, et al. Release of wine monoterpenes from natural precursors by glycosidases from Oenococcus oeni. Food Chem. 2012;135:80-87. Baffi MA, et al. Wine aroma improvement using a beta-glucosidase preparation from Aureobasidium pullulans. Appl Biochem Biotechnol. 2013;169:493-501. Villena MA, et al. β-Glucosidase activity in wine yeasts: Application in enology. Enzyme and Microbial Technology. 2007;40:420-425. Williams PJ, et al. Use of C18 reversed-phase liquid chromatography for the isolation of monoterpene glycosides and nor-isoprenoid precursors from grape juice and wines. J Chromatogr A. 1982;235:471-480. Van Rensburg P and Pretorius IS. Enzymes in winemaking, harnessing natural catalysts for efficient biotransformations-a review. Am J Enology and Viticulture. 2000;21:52-73. Perez-Martin F, et al. Screening for glycosidase activities of lactic acid bacteria as a biotechnological tool in oenology. World Journal of Microbiology & Biotechnology. 2012;28:1423-1432. Perez-Martin F, et al. Aromatic compounds released from natural precursors by selected Oenococcus oeni strains during malolactic fermentation. Eur Food Res Technol. 2015;240:609-618. Grimaldi A, et al. Identification and partial characterization of glycosidic activities of commercial strains of the lactic acid bacterium, Oenococcus oeni. Am J Enology and Viticulture. 2000;51:362-369. Boido E, et al. Effect of β-glycosidase activity of Oenococcus oeni on the glycosylated flavor precursors of Tannat wine during malolactic fermentation. Journal of agricultural and food chemistry. 2002;50:2344-2349. D'Incecco N, et al. Release of glycosidically bound flavour compounds of Chardonnay by Oenococcus oeni during malolactic fermentation. Food Microbiology. 2004;21:257-265. Grimaldi A, et al. A survey of glycosidase activities of commercial wine strains of Oenococcus oeni. Int J Food Microbiol. 2005;105:233-244. LI Ya-hui, et al. Assessment of β-D-glucosidase activity of Oenococcus oeni SD-2a. Food science and technology. 2013;38:48-52. Bourdineaud JP, et al. The ftsH gene of the wine bacterium Oenococcus oeni is involved in protection against environmental stress. Applied and Environmental Microbiology 2003;69:2512-2520. Desroche N, et al. Determination of an internal control to apply reverse transcription quantitative PCR to study stress response in the lactic acid bacterium Oenococcus oeni. Journal of Microbiological Methods 2005;60:325-333. Grandvalet C, et al. CtsR is the master regulator of stress response gene expression in Oenococcus oeni. J Bacteriology 2005;187:5614-5623. Beltramo C, et al. Real-time PCR for characterizing the stress response of Oenococcus oeni in a wine-like medium. Research in Microbiology 2006;157:267-274. Kang HR, et al. Quantitative analysis of volatile flavor components in Korean alcoholic beverage and Japanese sake using SPME-GC/MS. Food Sci Biotechnol 2016;25:979-985. Liu D, et al. Evolution of volatile compounds, aroma attributes, and sensory perception in bottle-aged red wines and their correlation. Euro Food Research and Technology 2016. Pozo-Bayón MÁ, et al. Wine Preference and Wine Aroma Perception. 2016: 139-162. Barbagallo RN, et al. Assessment of β-glucosidase activity in selected wild strains of Oenococcus oeni for malolactic fermentation. Enzyme and Microbial Technology 2004;34:292-296. Deutscher J, et al. How phosphotransferase system-related protein phosphorylation regulates carbohydrate metabolism in bacteria. Microbiology and Molecular Biology Reviews 2006;70:939. Capaldo A, et al. beta-Glucoside metabolism in Oenococcus oeni: Cloning and characterization of the phospho-beta-glucosidase CelD. J Molecular Catalysis B-Enzymatic. 2011;69:27-34. Jamal Z, et al. Distribution and Functions of Phosphotransferase System Genes in the Genome of the Lactic Acid Bacterium Oenococcus oeni. Applied and Environmental Microbiology. 2013;79:3371-3379. Wiesmann C, et al. The three-dimensional structure of 6-phospho-beta-galactosidase from Lactococcus lactis. Structure. 1995;3:961-968. Michalska K, et al. GH1-family 6-P--glucosidases from human microbiome lactic acid bacteria. Acta Crystallogr D 2013;69:451-463. Acebron I, et al. Structural basis of the substrate specificity and instability in solution of a glycosidase from Lactobacillus plantarum. Biochimica et biophysica acta 2017. Lopez S, et al. Characterisation of Hanseniaspora Isolates with Potential Aroma-enhancing Properties in Muscat Wines. South African J Enology and Viticulture. 2014;35:292-303. Maturano C and Saguir FM. Influence of glycosides on behavior of Oenococcus oeni in wine conditions: growth, substrates and aroma compounds. World J Microbiol Biotechnol. 2017;33:151. Fan G, et al. Characteristics of immobilised beta-glucosidase and its effect on bound volatile compounds in orange juice. Int J Food Sci Tech. 2011;46:2312-2320.